Many people assume Australia’s regions are getting a raw deal compared to the big cities. But beneath the oft-told “tale of two Australias” is a more nuanced story. 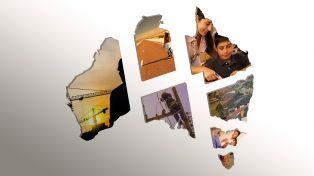 New research released today by the Grattan Institute shows that income growth and unemployment rates are not obviously worse in regional areas. Cities and regions both have pockets of disadvantage, as well as areas with healthy income growth and low unemployment. 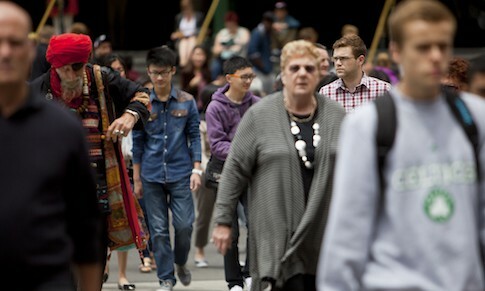 But shifts in population are driving a wedge between city and regional Australia. Fewer people are living in remote areas. And because of this, the economy is becoming more concentrated in cities and large regional centres. The gap in incomes between the cities and the regions is actually not getting wider. 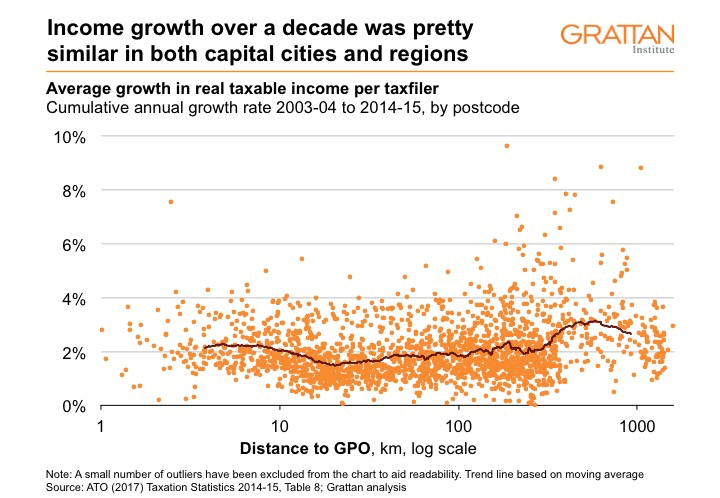 Income growth was particularly high over the past decade in the mining areas of Western Australia and Queensland. But this is not just a mining-state phenomenon: average growth in income per person was similar in cities and regions across every state. Income growth was high in areas close to the centre of Sydney, Melbourne and Adelaide. But suburban parts of these cities did not fare so well – areas in Sydney’s west and Melbourne’s outer ring had some of the lowest income growth in the nation. The absolute level of income tends to be higher in the cities than the regions – but this has always been so. The highest taxable incomes in Australia are in Sydney’s eastern suburbs, followed by Cottesloe in Perth and Stonnington in eastern Melbourne. The only regional area in the top 20 areas by taxable income is the mining region of Pilbara in WA. 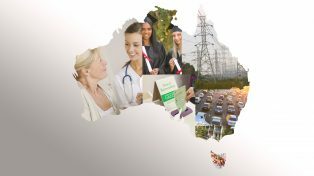 The lowest taxable incomes are in Tasmania and the regions of the east-coast states, especially the far north coast of NSW, central Victoria and southern Queensland. Unemployment is not obviously worse in the regions than the cities, but both have areas of strong disadvantage. Parts of Far North Queensland have the highest rates of unemployment: 40% or more, compared to the national average of 6.1% in 2016. Most of these areas have had high unemployment rates for many years. Unemployment tends to be higher in large regional towns than in surrounding rural areas. In the capital cities, unemployment is concentrated along the “spines” – built-up areas that follow major roads. Unemployment got worse over the last five years in many areas where the jobless rate was already high. The unemployment rate increased in the northern parts of WA, the Northern Territory and Queensland between 2011 and 2016. Unemployment appears to be entrenched in these areas. Unemployment also got worse along city “spines”: the Ipswich to Carole Park corridor in Brisbane, and the Dandenong to Pakenham corridor in Melbourne. The exception was the Botany Bay to Liverpool corridor in Sydney, where unemployment improved but remains high. Click on the map below to compare income, income growth, unemployment and population growth. This interactive map allows you to choose what data displays. For full functionality, click here to open in a new window. The regions are not noticeably falling behind in terms of income growth and employment. But there are big – and growing – differences in the location of economic activity and where people are choosing to live. 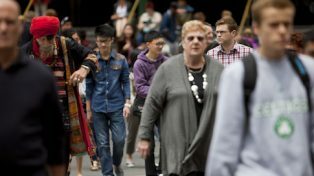 A long-term trend in Australia’s economy continued in the past decade: fewer people are working in agriculture and manufacturing, and more are finding jobs in services. The loss of agricultural and manufacturing work is felt most keenly in regional and outer-suburban areas. And many service jobs – particularly professional services – tend to cluster in the centre of cities. Large regional towns exert a gravitational pull on the populations of smaller rural communities. Major cities have a stronger pull again, drawing younger and more-educated people from the regions as well as the majority of new migrants. This is evident in the population data over the past decade: in general, populations declined in small towns in the east-coast states and South Australia, but increased in larger regional centres. Population – and unemployment – also tended to increase faster in the towns along the east coast. Populations in the major cities, meanwhile, grew strongly. Voters in regional areas are increasingly voting for minor parties. It’s often suggested this is because of the deteriorating economic position of the regions. But given that people in regions have generally fared as well as those in cities over the past decade, major parties may need to look beyond income and employment to discover what is driving dissatisfaction among regional voters.